FILE - Residents receive aid after an earthquake in Papua New Guinea in this image released March 7, 2018, by MAF International. Almost a month after a deadly earthquake, Papua New Guinea is struggling to get aid to desperate survivors, having allocated just a fraction of its relief funds, while a rent dispute left disaster officials briefly locked out of their offices. FILE - Locals inspect a landslide and damage to a road near the township of Tabubil after an earthquake that struck Papua New Guinea's Southern Highlands, Feb. 26, 2018. Destruction to roads and runways means authorities must rely on helicopters to fly in relief. But while nimble, the craft can carry only smaller loads than fixed-wing aircraft and cannot fly during the afternoon thunderstorms. In a joint report with the United Nations published Friday, the agency cited “lack of quality data” about food shortages, limited aircraft assets and “significant gaps” in sanitation support as being the biggest problems it faced. The government had approved relief funds amounting to 450 million kina ($130 million), O’Neill said initially, but a later statement mentioned only 3 million kina in initial relief — or less than 1 percent — had been allocated to the worst-hit areas. 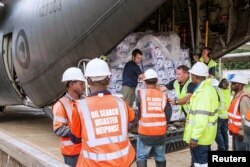 FILE - New Zealand Defense Force personnel unload aid supplies from a C-130 Hercules as part of emergency relief efforts after numerous earthquakes in the highlands region of Papua New Guinea, March 9, 2018. ​The impoverished country is also missing its largest revenue earner, after the quake forced a shutdown of Exxon Mobil Corp’s liquefied natural gas project, which has annual sales of $3 billion at current LNG prices. The firm is still assessing quake damage at its facilities.